With the FREEZING cold weather it really puts me in the Christmas spirit and Jacqueline's card fits perfectly! Look at this GORGEOUS STUNNER!! This is sooooo beautiful I don't even know where to begin! 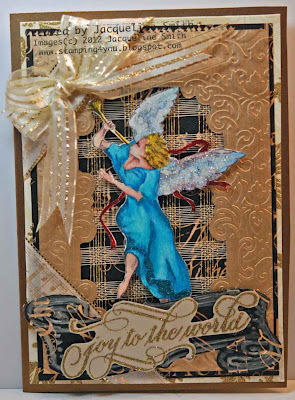 That gorgeous angel is from the Alleluia Angel stamp set from Flourishes. We will be starting to get in their Christmas sets very soon! I am excited because they have some really beautiful sets. Jacqueline colored this using prismacolor pencils which she is AMAZING at! I really need to use mine more. I have the big 120 color set but only about 10 are sharpened to a dull point. I don't like sharpening - LOL. I love this gorgeous blue it really pops off all the gold layers. I bet this is super sparkly and gorgeous in person. You can see that there is dazzling diamonds on the wings and you can see shimmer in the sentiment too. Someone is going to be super lucky come Christmas time to receive this gorgeous card! Be sure to stop by Jacqueline's Blog - Jacqueline's Creative Works of Art and let her know what a beautiful job she did!